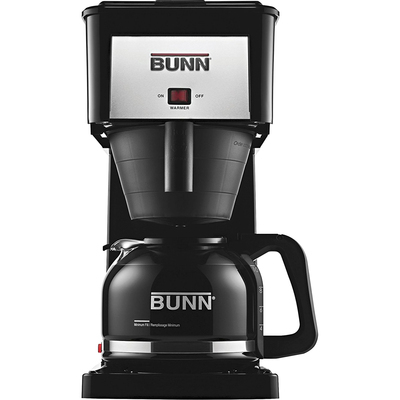 Quick-Brewing Coffeemaker Is Ready To Brew When You Are And Delivers Delicious, Hot Coffee In About Three Minutes. Coffeemaker Stays On To Keep The Internal Hot Water Tank Heated And Ready To Go. Unique Sprayhead Ensures Even, Complete Coffee Extraction. Water Is Spray-Released All At Once To Create The Needed Mixing Action To Evenly Extract The Ideal Flavor From Your Coffee. Porcelain-Coated Warming Plate Features A Lighted On/Off Switch For Quick Use. Internal, Stainless Steel, Hot Water Tank Holds Water At The Perfect Brewing Temperature..
Quick-Brewing Coffeemaker Is Ready To Brew When You Are And Delivers Delicious, Hot Coffee In About Three Minutes. Coffeemaker Stays On To Keep The Internal Hot Water Tank Heated And Ready To Go. Unique Sprayhead Ensures Even, Complete Coffee Extraction. Water Is Spray-Released All At Once To Create The Needed Mixing Action To Evenly Extract The Ideal Flavor From Your Coffee. Porcelain-Coated Warming Plate Features A Lighted On/Off Switch For Quick Use. Internal, Stainless Steel, Hot Water Tank Holds Water At The Perfect Brewing Temperature.